What started with 3,175 players is now just one. Jason Somerville was our Day 2 chip leader and he waded through a crazy day of play to take down the bracelet in fine fashion. We started today with 27 players and within 40 minutes we had already set a final two tables. Within three hours we were down to an action final table that saw a multitude of chip leaders, double-up after double-up, and eventually just Somerville with the bracelet. He won a few key hands late to regain the chip lead and ride it to victory, including this giant all in flip against Yashar Darian when they were playing four handed. Richard Fridvalszki raised to 140,000 under-the-gun, Yashar Darian re-raised it to 500,000 on the button and Jason Somerville re-raised all in for 2,500,000. Yashar called with and Somerville showed . Somerville has previously finished fifth, fourth, third, and second in WSOP events, but finally completed the wheel with a win today (maybe it was because his good friend Daniel Negreanu was on the rail the whole time). 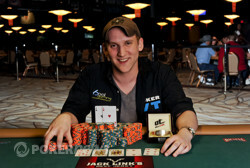 Either way, he ran hot, he played hot, and he is our champion, Congrats Jason Somerville on your first WSOP bracelet! A New Bracelet Winner is Crowned. Somerville takes the $1000 NLH'em title. 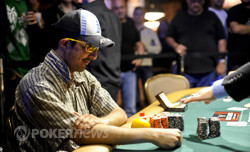 Yashar Darian waits to see if he is covered by Jason Somerville. On the very first hand of heads up play, Jason Somerville raised his button to 125,000. Yashar Darian three-bet to 350,000. Somerville thought for a bit before counting out chips to make a 950,000 raise. Just as he was sliding this chips in, Darian announced that he was all in and Somerville snapped him off. Although Somerville had the chip lead entering heads up play, this pot was for about 90% of the chips and would more or less determine a champion. 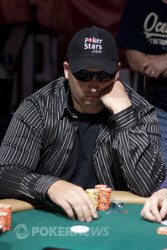 The flop came out and Somerville wouldn't win his first bracelet without a sweat. The turn was the but he still had to dodge five outs. The river bricked with the and Darian finished just one short of the bracelet. On the button, Travis Atkins moved all in for his final 450,000. Both Jason Somerville and Yashar Darian called and the board ran out . It wasn't until the river that Somerville bet out 150,000 and Darian folded. Somerville opened up , just barely beating the of Travis Atkins. With that pot, Somerville will take the chip lead heading into heads up play. He has 5.2 million and his opponent, Yashar Darian will start with 4.25 million. 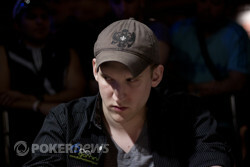 Jason Somerville raised to 100,000 on the button. Richard Fridvalszki then re-raised all in for his last 750,000 from the big blind and Somerville insta-called and turned over having the of Fridvalszki dominated. The board ran out and Somerville moves up to 4,300,000 going into three handed play. Yashar Darian called a button raise from Richard Fridvalszki out of the small blind and the two went heads up to the flop. The board came out , Darian let Fridvalszki continue for 165,000 and Darian called. The turn was the and both players checked to see the river. Darian fired out 200,000 and Fridvalszki thought for a while and even stood up before throwing in the chips. Darian showed which was good enough to win the hand. The very next hand, Darian raised his button to 100,000 and both Jason Somerville and Travis Atkins called out of the blinds. The flop came and all three players checked. The turn was the and again, all three players checked. The river was the and this time Atkins led out for 100,000. Darian made the call and won with the . 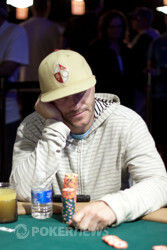 With those two pots he has moved his stack back into the chip lead with 4.5 million. From under the gun, our new chip leader, Jason Somerville, raised to 100,000. Action folded to Yashar Darian in the big blind who made the call. The flop came and Darian checked to Somerville who bet 150,000. Darian thought for just a few seconds before announcing he was all in for 1.4 million. Somerville checked his cards again and made the call. 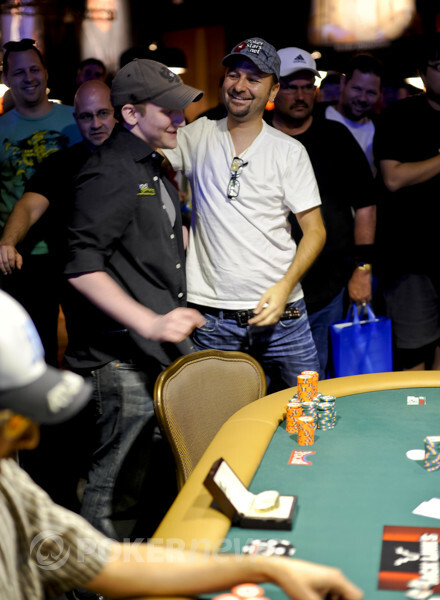 Daniel Negreanu, who is friend with Somerville, is drinking and decided to narrate the hand to the crowd. "We need a seven! Give us a seven... or a nine would be ok too," he said. The turn was close, but neither. It was the and Somerville needed one of the two remaining Aces. Negreanu let everyone know in case anybody was falling behind. The river was the and Somerville gives some of his new found chips back to Darian.